Today’s show featured one guest due to a cancellation therefore I worked in some of my own on the job material for listener enjoyment. On the opening segment, I talk about breaking into the wrong person’s home this week due to an oversight on my part. I sell foreclosed properties and when the banks assign them to agents, the first step is to verify occupancy of the unit. Condos can be a bit tricky since they do not have obvious signs of vacancy like a detached home would and on top of that, we often have to verify unit numbers against the prior owners in public records. Long story short, I mis-matched a unit this week due to the prior owner’s father also owning a unit in the development and I moved forward to re-secure that unit. The actual owner of the unit was away up north and so notices went un-responded to that were on the door. As my vendor began to drill out the lock, the neighbor came over and advised them they had the wrong unit and were probably looking for another that was owned by the owner’s daughter. After she contacted me, upset at first, we worked through the issue and secured that unit back properly and I lucked out given she also was a Realtor that sold bank properties and had once almost made a similar error. I have had two other instances of re-securing the wrong unit, both condos, in my 8 years selling bank owned properties and I share the brief versions of those stories also on this opening segment. One such instance cost me a TV and is a pretty good story, the other time, I got lucky again as the occupant whose property I accidentally rekeyed was sold by my friend and she was able to smooth it over for me. Tune in to the 8/14/15 show’s first segment to hear the full stories of these on the job mistakes. 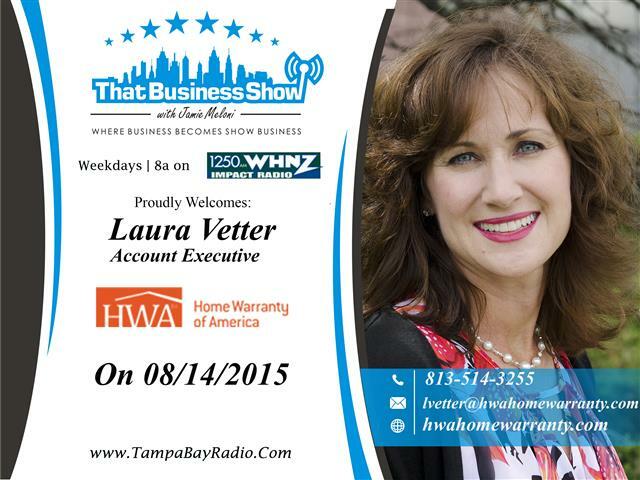 On the 2nd segment, I welcomed in Laura Vetter, Account Executive with HWA Home Warranty of America. She and I along with my producer shared some laughs and filler questions about my opening stories and we moved on to discuss her line of work. Laura has worked in sales most of her career having been in radio sales prior to her role with HWA Home Warranty. Laura explains the benefits of the home warranty and how they differ from home insurance policies. Home warranties can be placed on a home at any time and typically last for 12 months at a time, but the HWA policy gives an added month making it a 13 month policy. HWA warranties range in costs from about $455/year to $530/year and generally speaking cover the appliances, HVAC system, fans, basic electrical and plumbing components and a few other items. Given the demand on HVAC systems in the State of Florida alone, these warranties make a great investment just to cover the costs of maintaining those alone typically. Homes do not have age restrictions so anyone can purchase a warranty and buyers of new homes should inquire with their Realtors prior to close on the purchase of one of these units. Pricing discounts are available to buyers if they purchase a warranty through a Realtor at closing. Visit http://www.hwahomewarranty.com for more information and reach out to Laura directly at 813-514-3255 or email at lvetter@hwahomewarranty.com to pick up a home warranty today! This entry was posted in Entrepreneurship and Business and tagged foreclosures, home warranty, hwa, hwa home warranty of america, real estate. Bookmark the permalink. ← Show Recap – Flooding, Economic and Transportation Discussion with BOCC Chairman Murman and Sapphire AV Experts!